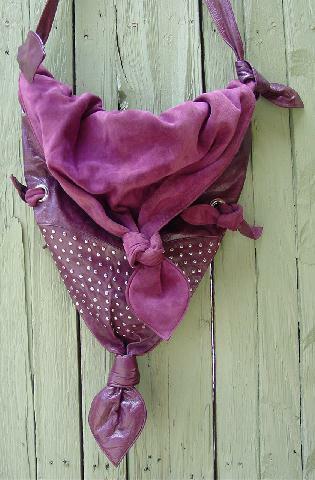 This triangular purse is in a very soft purple-wine leather and grape-wine suede. The gathered flap closure has an outer surface in suede and an inner thick black fabric lining. There is a magnetic closure under the flap, located behind the knot. The two side decorative ties have suede on one side and leather on the other. The front bottom half has silver-tone studs all over. 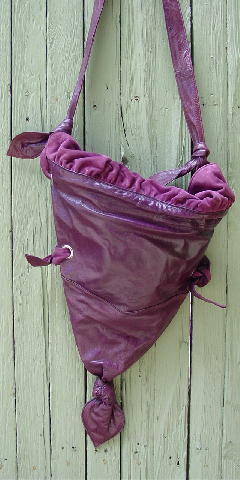 The leather 42" long strap is attached to the purse by loops, with leather on one side and suede on the other. There are four silver-tone rivets on each side, which the loops go through. 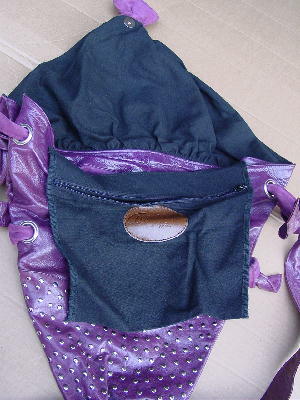 The interior rim is in purple leather, and the interior lining is in soft purple suede. 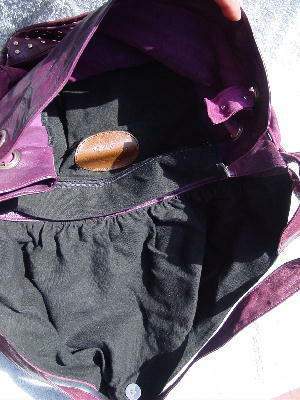 Attached in the interior is a black fabric zipper compartment, which is actually the inner purse - where you keep your things. The main body of the purse can't be used, because there is nothing covering the back side of all the studs. 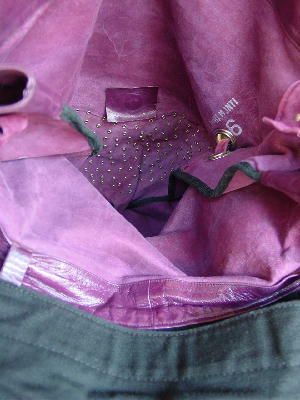 The "wasted" space in the design of the purse is intentional. The black fabric compartment is 10" across the top, 8 1/2" across the bottom, and 6" high. The purse is big in size, but light in weight because your usable storage area is small. It has a few dark spots on the back side of the suede flap by the gathering. It's from a Los Angeles model/aspiring actress.